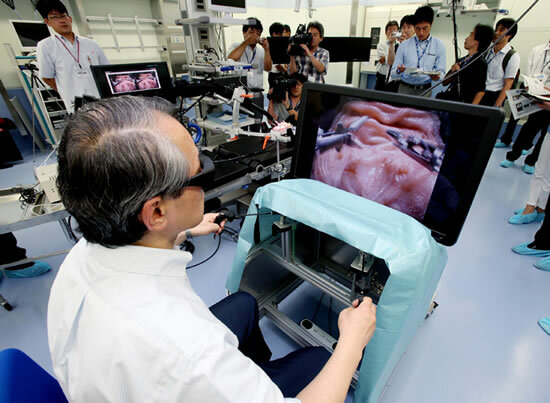 NEDO and Kyushu University scientists in Japan have developed a 3-D endoscopic telesurgery robot system that offers surgeons a broader, stereoscopic view of affected areas and gives them more intuitive control of forceps and other surgical instruments. The new system, with three cameras set at different angles, provides 3-D imagery of patients on surgical bed to surgeons who are performing telesurgery. The new system can be used for surgical procedures for a larger variety of diseases. In performing surgery for brain cancer, one camera is set in front and two others on both sides. The system allows surgeons to remove tumors effectively while avoiding damaging healthy tissues. The system is expected to improve the survival rates of patients by reducing the risk of failing to completely remove malignant tissues. NEDO and Kyushu University hope to introduce the new system for practical use within five years for three types of surgical procedures: cranial nerve, breast and digestive organs. A U.S.-made 3-D surgery robot system, called da Vinci is already used in operations for prostate and other cancers. The new system costs less than the da Vinci system and its main control unit is as small as a lunch box. While the robot control mechanism will be the same for all types of envisaged applications, surgical instruments will be changed depending on the surgery. I wonder if this is necessary at all. I’d love to hear from some surgeons.